It has been silent on this blog for too long. It’s been a busy time for me, both at home and at work. And I had another excuse. Bill Atkinson asked me to add my model to the comparison between Van Holst and Atkinson. It turned out the numbers didn’t compare too well. So I went through my code again and again to find discrepancies. Unfortunately, I didn’t find any. This evening, I went through everything again in a final effort to understand the difference between my model and the two others. I give up. It doesn’t make sense to keep looking myself, to stubbornly restrict my thinking power to only my (limited) brain. Are we in the age of open source and web 2.0 and on-line collaboration or not? It’s time to show the unfinished work and let it be criticized in the open. So, here we go. The chart in figure 1 gives the power distribution. All values are in Watt, averaged over the stroke. The numbers in bold are direct outputs of my model. The other numbers are calculated. So, blade losses are calculated directly from the blade force and blade slip. Drag losses are calculated directly from the drag force and hull velocity. The power going into “momentum” is calculated directly from the acceleration of the rower’s mass, and the power at the oarlock is calculated from the propulsive force and boat velocity. Atkinson calls one of the cells “Footboard”. 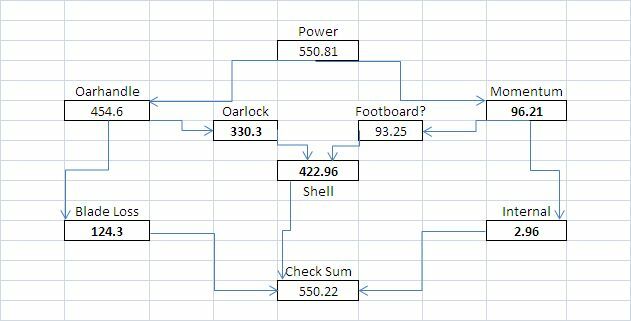 In my model, I have access to the energy “stored” in kinetic energy (rower and shell – as in excess of the average system velocity), but I am not able to calculate directly the power exercised “at the footboard”. This is the reason for the question mark behind “footboard” in figure 1. I have estimated the power dissipated in the rower’s body using Van Holst’s explanation, see figure 2 and the explanation just below it here. Well, that didn’t hurt, didn’t it? Not yet. Bill Atkinson pointed me to the same issue as Martijn has done a long time ago. In my equation for drag and lift, I multiplied the blade area A with the sine of the angle of attach , which was wrong. I’ve corrected for this and updated the numbers in figure 1. This entry was posted in rowing physics on March 1, 2011 by sanderroosendaal. I will share details of the model with anyone who helps me understand the discrepancies between my model and the two others. So, if you have requests for graphs or snippets of python code, let me know and I will send it to you or publish it on this blog. Please understand that my response time might be slow due to work and family responsibilities. Just for fun, try using these figures as input. These are from a later data ( Kleshev, AIS.) set than what Atkinson used to validate his model. I cannot give you everything but these are a good start. As for the other variables they’re not too hard too estimate and may help you out. Just use an Empacher HM2- for all your other specs. And Concept II blade specs. Inboards usally vary by 1.5 inches max. You may want to look at how you arrive at your peak force. Have a play with that for now. OK. Combined mass of Oarsman is 88.5kgs – i.e. these are girls? Or are they heavy men with an average weight of 88.5kgs? Will try. Re your other comment, you’re of course right. So in another posting I have compared the power/kg from last season’s Luzern results and compared them with data for cyclists. In the right ballpark. Another thing, the Atkinson/Van Holst comparison uses unrealistically small blade areas. I have confirmed this with Bill Atkinson, but still I am suspecting there’s something wrong there. Compare the “blade slip” numbers between the different models. I arrive at a much higher number, which is to be expected when using tea spoons. Sorry for the long delay. Business trips and other stuff. I took standard values for 2- weight and rigging, and blade size and length. It is bunk to claim any model of anything is valid if it only relies upon a single set of data for verifaction purposes. I could write a model that was wrong in a few areas but would output data that was correct for a certain set of data. Agree. I originally used the following data for verification: See my post on Lucerne 2010 results. Further, I used my own sculling results compared with knowledge of my Concept2 ergometer results. The Atkinson/Van Holst comparison is using a quite strange value for the blade area. It is very small, and thus in my model a lot of energy is wasted in “blade slip”. Average weight, not combined. Oarsman weight is critical in smaller shells so thull is less. What data set are you using exactly? It’s very very difficult to capture a good data set and this level of modeling is on the simple side. Simple is no dramas but to your point, blade sizes, etc inserted become quite novel! What is not ( I suspect) is being effectively considered is that the drag co-effecient of the System is constantly changing relative to water & air speed / angle of attack, which must be calculated separately. The change in inertia of moving elements within the System will change the relative speed of the System to its environment and therefore its drag-coefficient at any given time during the stroke cycle overall. In addition to this, shell designs, System weights, Wetted surface area of the Shell both above and below the LWL, etc, etc, etc, makes the drag co-efficient perhaps the most complex variable in modelling the Rowing System. More than half the race is spent during the recovery phase. For the shell drag coefficient, I do use a (velocity dependent) ITTC approximation. Sorry for the short answer but I am traveling. No worries, it’s good that you do for your drag co-egg, but an accurate model of drag combines over 100 variables. It all gets back to what you want to get out of your model. I/we create models that point us in the right direction to tweak things for a potential improvement. Academics just like seeing numbers add up. Of the many things I have modeled in time the Rowing System is by far the hardest. I think you would get a greater sense of satisfaction if you built a full-on model. Start by listing every single variable there is in the System. It’s long and complex but it will give you true insights as to what is going on. Atkinson has never even sat in a boat! That is all time gold. I would not worry about their findings. Do it properly, happy to help. You should start from scratch. Aitkinson has never be engaged at a national level, the other guy rowed a boat apparently. 1) The blade loss seems to be a major difference. Did you have time to reconsider these equations https://sanderroosendaal.wordpress.com/2010/07/12/basic-equations-3-oars-and-blades/#comments ? If not than you may have a higher blade velocity (and associated slip) at the catch and release. 2) The shell resistance is pretty much the same. The only other difference is the internal kinetic energy loss which may be explained by different assumptions. Atkinson assumes a relatively high loss. 3) The internal kinetic energy may be different because of different calculation of the body kinetic energy. I suspect that van Holst only looks at the cm of the body and does not take into account the body parts moving at different speeds. You are looking at a pseudo body part model (https://sanderroosendaal.wordpress.com/2010/07/12/rower-center-of-mass/) maybe Atkinson uses a slightly different model in which relatively higher energy/momentum is achieved. Do you take the sum of both the drive and recovery or do you only consider the drive? 4) Also the body-boat momentum/kinetic energy can be transferred to the footboard, the handle but also the water. It is very strange to see such diverse figures (50,100,200 watt) for something simple as momentum but is is also strange to consider momentum as either lost or transferred to the foot stretcher. Maybe this explains why you don’t make use of the stretcher. It is very strange to see such diverse figures (50,100,200 watt) for something simple as momentum but is is also strange to consider momentum as either lost or transferred to the foot stretcher. I mean something basic as momentum. Not simple! I think Sander & thanks for your thoughts Martijn( I agree) it may be worth going back to 101? As these hits and misses are a little too big. It could easily consume a year, but after that? There would be an in-depth understanding of every aspect. The last few months has seen my work focus on the bat logic foot stretcher. Actual data has concluded they are inefficient. I’m pretty much just tweaking things now across all crews for London. We have a big decision on mens hw that needs to be made yesterday! I will in the next week, draw up a new blank schema. Blade slip is one of the harder areas to assess. 1. Blade lift and drag. I am doing sanity checks on that and will post some of the results. 2. Interpretation of the different terms, especially momentum. I will post my equations and then we can discuss if these are correct. 3. Difference in interpretation of the different boxes in Atkinson’s diagram. I think this is closely related to (2). 4. The fact that Atkinson and Van Holst use unrealistically small blade size. Could there be a difference of a factor 2 in blade area used as inputs in the 3 different calculations? 5. Rower center of mass. I agree with Martijn’s comments. There are large differences between the models here and none of them is capable of modeling the details of e.g. the recovery. I have had some time to review most of the ‘bits and pieces’ on this thread. In reference to point 3 of your last comments: “…The internal kinetic energy may be different because of different calculation of the body kinetic energy. I suspect that van Holst only looks at the cm of the body and does not take into account the body parts moving at different speeds…”. You are correct 100%. I have had this disagreement with the academics before. Their model – in effect – states that there is no benefit in adjusting/optimising/changing, etc the oarsmans’ inertial recovery phase. It’s not worth tapping the keys as I’m sure you can work it out in your head. Send me an email at jamesdelphic@gmail.com and I will share some things with you.